There are actually three kinds of opioid drugs. There are synthetic opioids, semi-synthetic opioids, and natural opiates. Natural opioids are called this because they come from a natural source. According to ISATE, they “are derived from the… opium poppy.” While some opioid drugs are completely manmade and manufactured in a lab, natural opiates come directly from this plant and the milk that comes from its seedpods. What is the Opium Poppy? 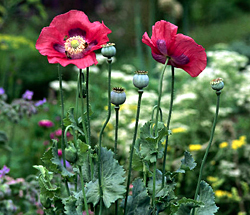 As stated by the DOJ, “The poppy papaver somniferum is the source for all natural opioids.” While it is now illegal to grow in the United States, “it was grown in the Mediterranean region as early as 5,000 B.C., and has since been cultivated in a number of countries throughout the world” (DOJ). The natural opiates are found in “the milky latex sap of the mature seed capsule of the opium poppy,” while the seeds are used in baking and other things, like the poppy seeds on a bagel (Palomar). The natural opiates are harvested from the poppy, processed, and made into drugs. Which Opioids are Natural Opiates? Some opiates are made from true poppy plants. Opium is one of the chief natural opiates. It is still used commonly to this day, mostly as a recreational drug. Throughout history, it was used as an anesthesia and remedy for nervous disorders, cancers, migraines, and all manner of things. Opium is classified as a Schedule II drug, which means that it has a high abuse potential but that it is still used in some medicinal ways (DOJ 2). Morphine is another natural opiate. It is often used as a pain reliever, but some people do use it illegally to get high. Codeine is another natural opiate, derived from morphine. In the US, “a small percentage of the morphine obtained from opium is used directly” while the rest “is converted to codeine and other derivatives” (DEA). Codeine is sometimes prescribed to relieve pain after surgery, but it is also used commonly “to reduce coughing” (NLM). It is still abused by many people, often in the form of drinking the cough syrup. Are Semi-Synthetic Opioids Considered to Be Natural? No. Because they have to be processed with other synthetic materials in order to be made, they are not considered to be natural opiates. Generally, the term opiate is sometimes used to refer to all opioid-based drugs, but it only accurately described natural opiates like morphine, opium, and codeine. All other narcotic drugs, semi-synthetic or fully synthetic, should be referred to as opioids.